What attracted me to the Montessori philosophy when we first started homeschooling was its emphasis on teaching toddlers and preschoolers practical life skills. My daughter was using a knife early on (she’s not quite 3 in that post). 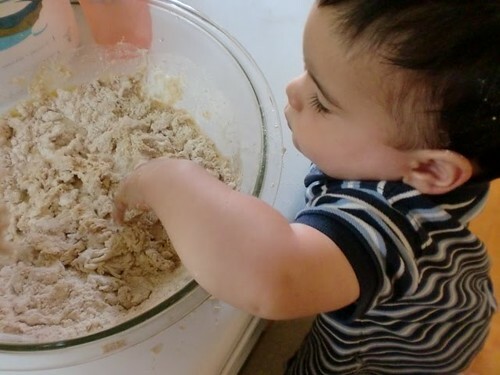 I strongly believe that kids should be included in food prep early on. My 11 month old stands at the kitchen counter and watches me prepare dinner. She munches on zucchini, or whatever I am cutting at the time. Soon she’ll be able to help me stir or add things to a mixing bowl. 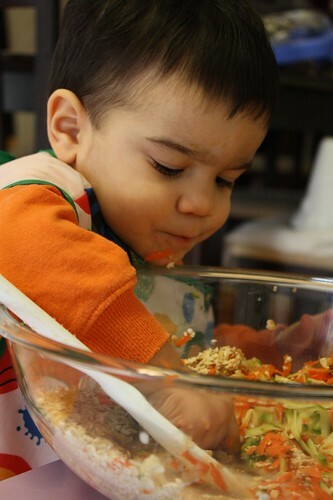 When we lived in Costa Rica and I had a huge kitchen island, I would set up my then 3 month old son on his tummy time pillow so he could watch his sister and I prepare dinner. My oldest was 2 at the time and would tear lettuce for our salad. My kids have always been in the kitchen with me. Some time back, Katie of Kitchen Stewardship, my favorite go-to for healthy recipes, offered free knife skills videos. I waited until the last minute to sign up to receive them since I thought my kids were already well-versed in knife skills. After watching them, I was so impressed. Katie did a fantastic job making these videos. She breaks the steps down so efficiently that even I learned some new things about cutting. Did you know there are 4 safe ways to cut using a sharp knife? I wish I had had these videos to teach my oldest two proper knife skills when they were little. I love how she gives names to the different ways of holding the item you are cutting to help even the youngest kid remember. You can watch them too. Katie is pulling them out of the Kids Cook Real Food eCourse once more and offering them free as a special gift to you again until June 6th! When she did this last January, over 7,000 families signed up to teach kids knife safety and techniques. I’m so excited that it’s happening again so you get a chance too! CHECK OUT WHAT’S IN THE VIDEOS HERE. There’s one to watch with your kids that will demonstrate how to safely handle dull and sharp knives (you decide which on depending on their age and maturity), and then there are two more training videos for YOU to help you feel completely comfortable and confident giving your kids sharp knives. Don’t worry if you feel like you have a busy day or week – just sign up so that you have access to all 3 videos as soon as they’re each available, and you’ll get reminders to make it happen through June 6th.